Trophy hunting in Namibia started around 1960 and has since then become a well-managed and regulated tool in the management of Namibia’s natural wild life populations outside of National parks. 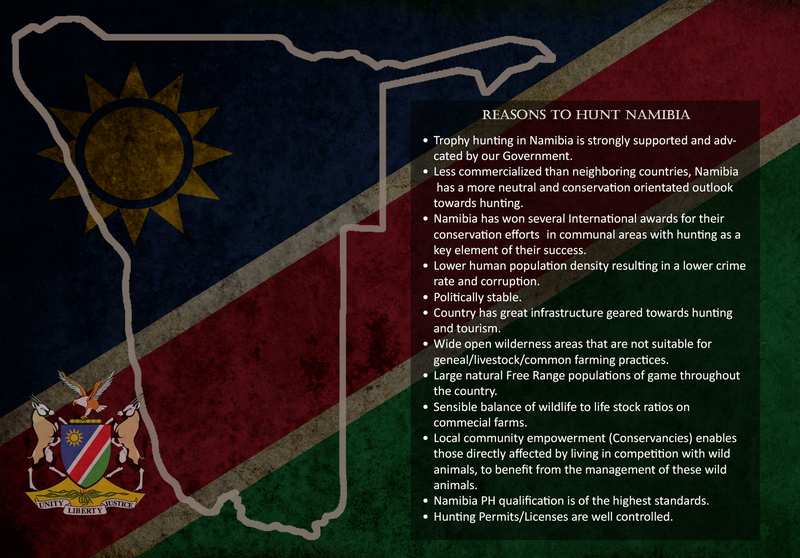 Namibia is regarded internationally as the “Poster Child” of Africa with regard to its wildlife management policies on both private land as well as communal based conservancy areas. The country has won several International awards for the profiling of their groundbreaking conservation actions that has resulted in wildlife populations recovering to well above sustainable numbers, with major benefits towards the rural communal conservancy areas. These prestigious awards include Markhor Award for Outstanding Conservation Performance in 2012, the WWF – Gift to the Earth Award in 2013, and the United Nations World Trade Organization (UNWTO) Awards for Excellence and Innovation in Tourism in 2015. The income from Trophy and Conservation management Hunting in these Communal Conservancy areas, which covers about 20% of Namibia’s land surface, places many of these Conservancies on a sound financial footing as a direct result of trophy/conservation management hunting. Without this massive financial benefit, about three quarters of these Conservancy areas would not be in existence. This success has also echoed onto privately owned land in Namibia where a shift over the last 40 years in the attitude towards natural wildlife and its financial benefit, has resulted in commercial cattle farmers tolerating larger groups of game as well as predators on their land that are in direct competition to their livestock for resources. To ensure that Wildlife and hunting is are preserved for future generations and that there will always be sustainable natural populations of game, Hunting clients need to invest their money into African Countries where the governments understand that trophy/conservation hunting is a valuable conservation tool and help to support and control the industry. It is clear that the Namibian Government is the leader in this field.